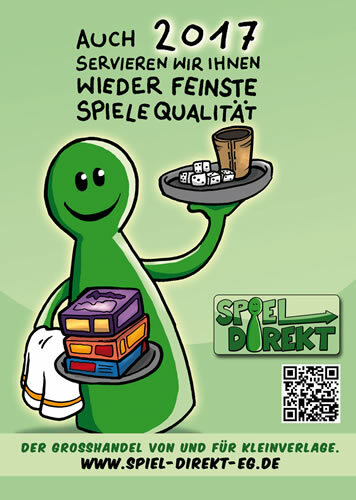 You can preorder the games at Spiel direkt eG. Mücke Spiele: ¡ Adios Calavera! Mücke Spiele: ¡ Adios Calavera! Playful get-together of the dead and the living. On the central Zocalo, the living and the dead meet in a yearly get-together for a grand fiesta. DThe common dance will lead to the light or the shade and both parties are trying to get there first. The distance a figure may cover depends on the number of figures standing crosswise. And some figures have special abilities they can use for themselves of others. Preorder Mücke Spiele: ¡ Adios Calavera! at Spiel direkt eG. Haas Games: Food Facts is designed for two to six players aged 10 and up. Haas Games: Food Facts at Spiel direkt eG. Haas Games: Genies is a game for 2 to 5 people. The players bet for different Genies in six rounds. After all the players gave their bet, the bets are going to be compared. The player with the highest gets the extra points. The Genies do have different disciplines. Finally you have to reach the most attractive profile. Haas Games: Genies at Spiel direkt eG.